GTF strike ends in 9th day. GPA boilers relit. Educative production and admins bowl-game junket plans resume immediately. LCNI predicts neural activity to reach normal levels by noon. 12/10/2014: The Emergency Senate meeting is on, for 3PM Today, 115 Lawrence. UO Board committee meetings start at 10AM today, here. Updated pretty often. Days 1-4 here, Days 5-6 here. Also read the UAUO website here, UAUO Facebook page, here, GTFF website here, GTFF Facebook here. Not to mention Tobin Klinger and the UO PR flacks on their $500K “Around the 0” blog, if you can find it on google. – Sorry, I got nothing other than the same sorts of rumors that led me to bet a bottle of scotch that Coltrane would cut his $300-an-hour carport easement lawyer out of the process and make a deal last Thursday. – Bargaining went on til 1AM and will continue today at 10 AM. – 2:30 PM: Diane Dietz reports in the RG that a “surprise bargaining session” is underway this afternoon. – Yesterday, December 7th 2014, a date which will live in infamy, President Kyr called an emergency Senate exec meeting to deal with the latest sneak attack from the UO Board. The University of Oregon had been at peace with that Board, and in fact had just appeased their demand to approve Jim Bean’s “Sports Product Design” program. More on this will be posted here, as circumstances develop. Tagged GTFs. Bookmark the permalink. 23 Responses to GTF strike ends in 9th day. GPA boilers relit. Educative production and admins bowl-game junket plans resume immediately. LCNI predicts neural activity to reach normal levels by noon. Oh the irony, it burns! “surprise bargaining session” — The only surprise would be of the U of O admin got a clue about what a reasonable request this is & grant it. Also wonderful write up from Huff Post… Some fun facts about how OSU pays more. Don;t miss out on scrolling through the bottom of the page pictures. A Beatles reenactment & GTFF’s w the Mascot. And thank you UOMatters for keeping us informed. Now onto the Senate meeting. Glad the strike is done! Sounds like a good solution… giving grad students/GTFs control of access and yet keeping it a “student” benefit. They handed out pencils??? Uh thanks. “They handed out pencils?? ?” Yes, we did, it was a nice gesture as most of the undergrad finals are on Scantron sheets, which require the use of a pencil to fill the form. It’s a perfectly fine gesture. Putting it in the letter is questionable, however. It suggests that the union and its members have no clue as to the magnitude of the disruption they caused. The GTFF doesn’t have an extra half-mil or so lying around to pay a strategic communications staff. If you like, mentally insert “For example” before the statement about the pencils. The GTFF did much more to assist undergrads during the strike than hand out pencils. What exactly did the GTFs do to assist undergrads? Hold study sessions? Answer questions via email? Hold office hours? These things would have been more helpful to undergrads than handing out pencils packaged with a healthy dose of propaganda. Our actions resembled an arsonist setting fire to a home and then helping out with the rescue effort. Well, that arsonist parallel is one way to look at a strike. Another way to look at a strike is disrupting the status quo when the status quo is only working out well for one side. Holding study sessions and office hours, answering questions via e-mail, look a lot like not striking. Which was, of course, up to every GTF. You are correct that those things would’ve been more helpful. And I’m sure there are some undergrads who still resent GTFs, or even some who are thankful their GTF chose not to strike. Some of my students emailed me, knowing I wouldn’t be able to respond, just to express support and to say “don’t give up” even as we headed into finals week. I had zero students email me with complaints. Fortunately, the point of the strike was not to be helpful to undergrads but rather to make a collective statement about what happens to this campus when GTFs stop working. The admin pretended the work stoppage had no effect until they could pretend no longer. 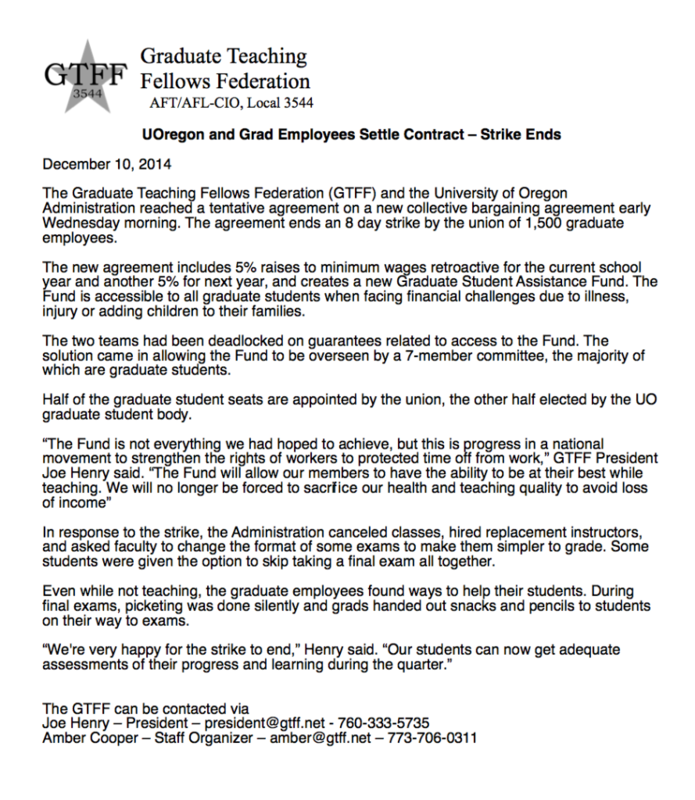 It’s not the GTFF’s fault that the strike played out the way it did. We’ve been bargaining in good faith for over a year. Did you attend any of the bargaining sessions last year? Hard to imagine that anyone who did would still seem to “side” with the admin and against GTFs here. Strange world. I will not stand for implications that breaking the strike would’ve been better for our students. It was really difficult, but as the strike wore on, backing down would’ve conveyed to my students pretty much the opposite of what I believe and teach. Did the admin agree to put the specifics of the graduate assistance fund and absences provision in the CBA? Neither the announcement from Coltrane nor the one from the GTFF mentions this. Will uomatters find out how much the admin paid to cover GTF duties? I’d really like to know. Yes, there are more specifics about the fund in the CBA that what appears in the GTFF press release, and my understanding is that denials at least are grievable. More to the point, they have a much better chance of being fairly grievable. But there were three sides involved, lest you forget, and it was undergrads that bore the brunt of “disrupting the status quo.” Or are they not a priority? Precisely, and those were the only ways to help students out during finals. Suggesting anything else is just a poor justification for a self-serving end. Handing out pencils with a message to support the union was an insult to every undergrad. As for not striking, things are not exactly that simple when you belong to a union. It almost sounds like you are suggesting that GTFs who opposed the strike should not have walked out? UOmatters: only about half my comments are making it through moderation. Is there something behind this? Yes, you’re sending me too many comments with too little new content, they often read like they’re just designed to provoke people, and it’s getting boring. I’ve done the same to people on the other side of this argument, and will continue to do so. 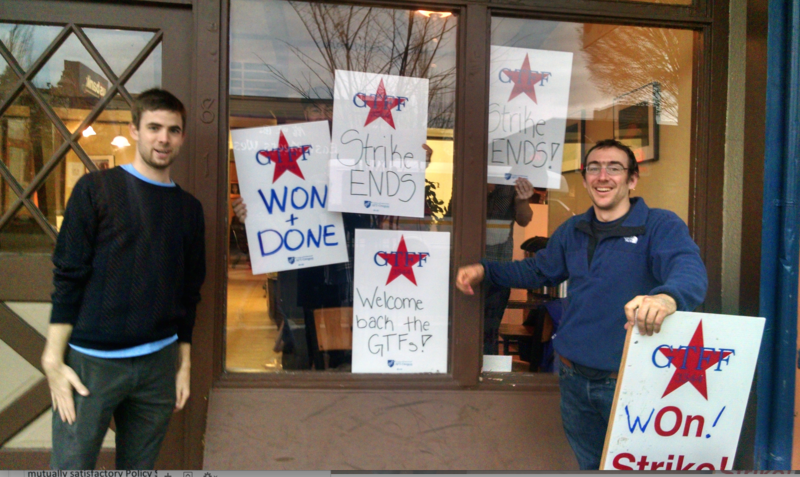 Here comes an honest question, not snark: isn’t it true that not all GTFs did strike? I read it in the papers and the president’s and provost’s messages certainly made that claim. Every member of the union does have the option not to walk out. They probably make their decision based on their values and their calculation of the means, the end, the cost (to all three sides)–in whatever order. This too is an honest question, not snark: are you suggesting that for a GTF to strike means only not holding class (or section) and not grading? Because I was thinking that walking off the job meant walking off all of the job. The cynic in me wonders if this decision is based more on the sports side wanting things to be tidy, while they await a possible Heisman award & head to the Rose Bowl? In any case, it’s a win for the GTFF’s. Glad faculty, UPS & Sanipac backed the union strikers.